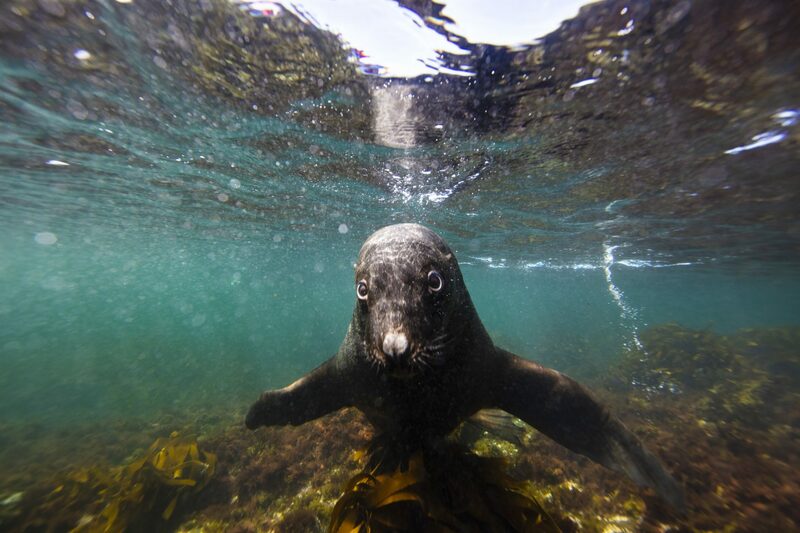 Chasing waves on Enderby Island starts with getting to know the locals. They’re furry and blanket the place like lolling beach bums of the south. A little respect (and a lot of patience) will go a long way in this remote part of the Southern Ocean perched on the western edge of the Campbell Plateau. But there is surf to warrant the extra effort required here. 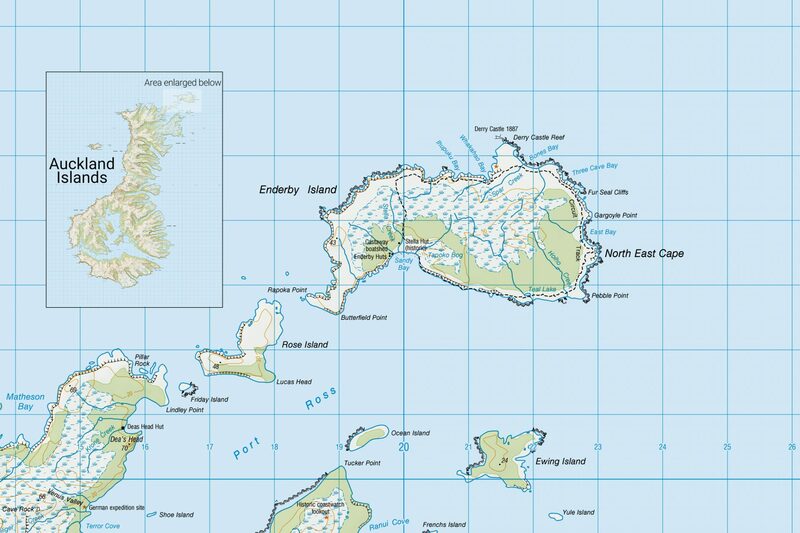 Enderby Island is a 710ha low-lying island in the north eastern tip of the Auckland Islands group approximately 460km south of Bluff. 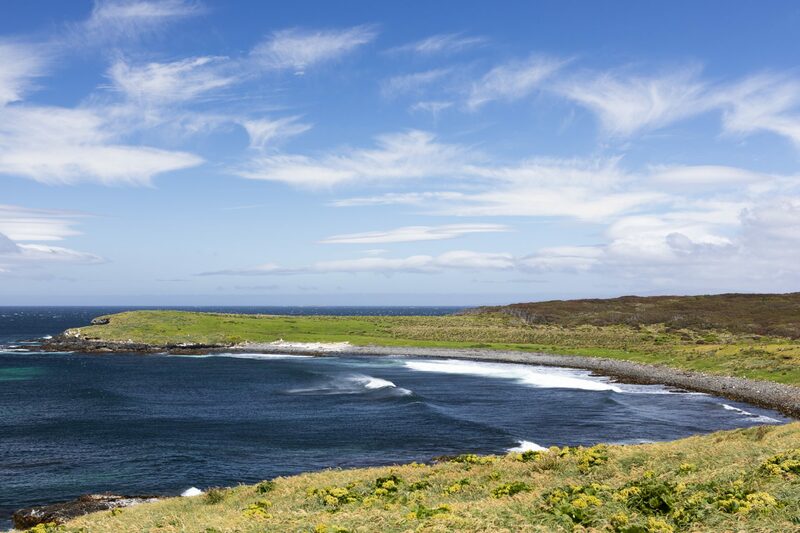 As far as the Auckland Islands go Enderby has the best weather, which can reach 16°C in summer and hovers between 4-10°C throughout winter. It’s a haven for sea lions, yellow-eyed penguins and Port Ross to the south is a haven for southern right whales throughout winter. 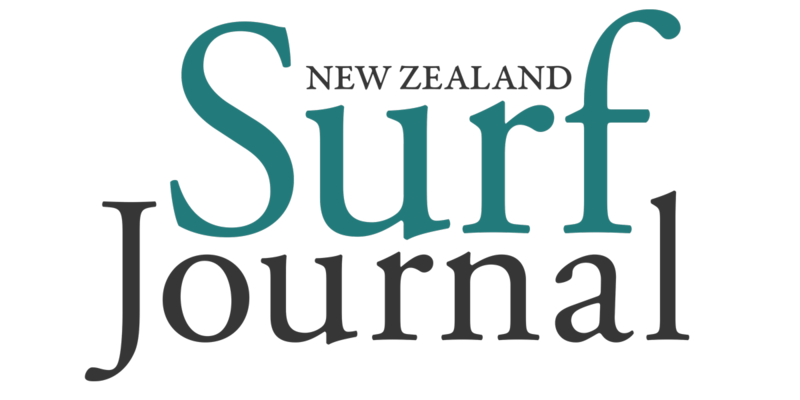 Otago University researchers estimate around 370 whales visit Port Ross each season. 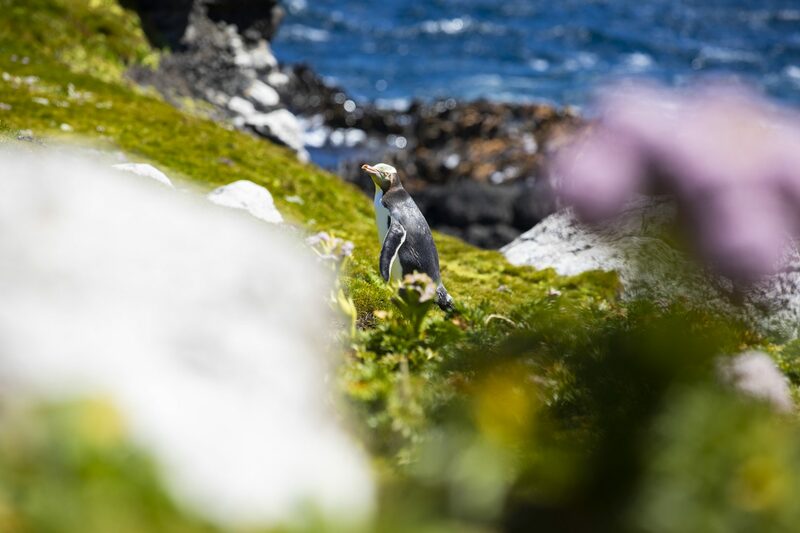 As far as the subantarctic islands go, this place is brimming with wildlife. 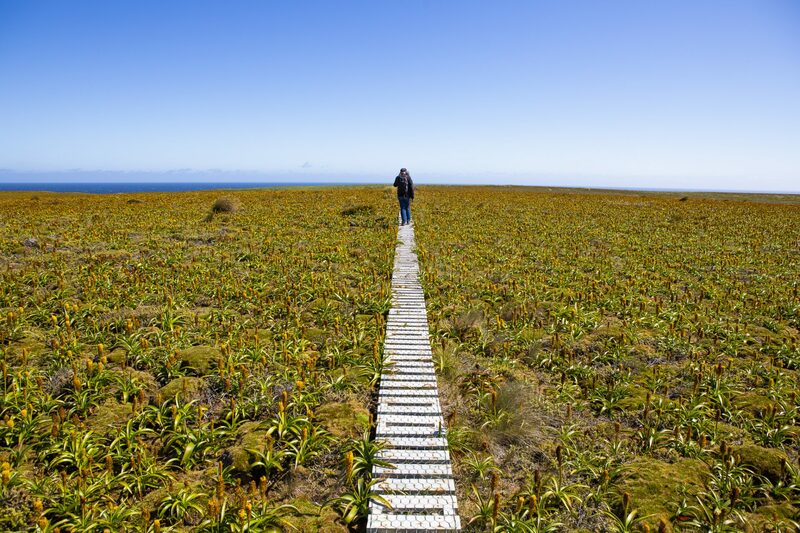 Enderby Island, Auckland Islands, New Zealand. The Spirit of Enderby finds anchor in Sandy Bay and we take the zodiacs toward the beach. I’m accompanied by someone who I imagine would be as close as we might get to the king of Enderby Island: Martin Cawthorn. 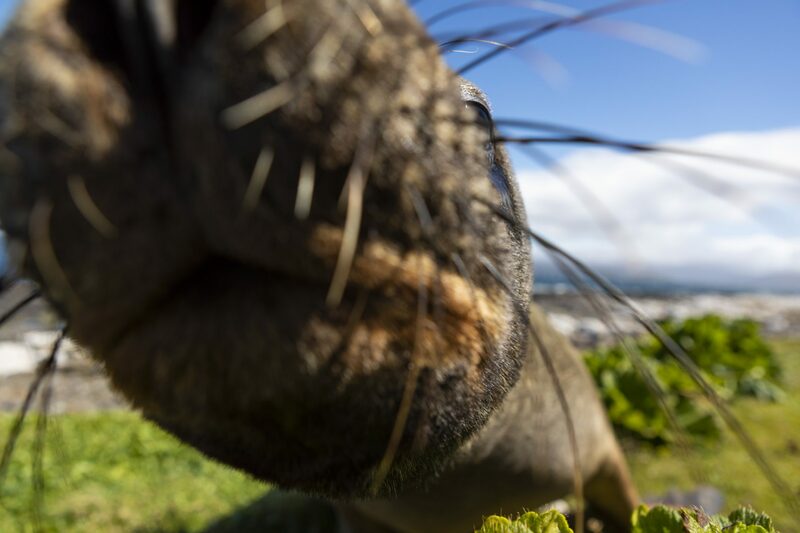 He’s a research scientist who has spent 19 summers on Enderby Island studying its sea lion (Phocarctos hookeri) population. 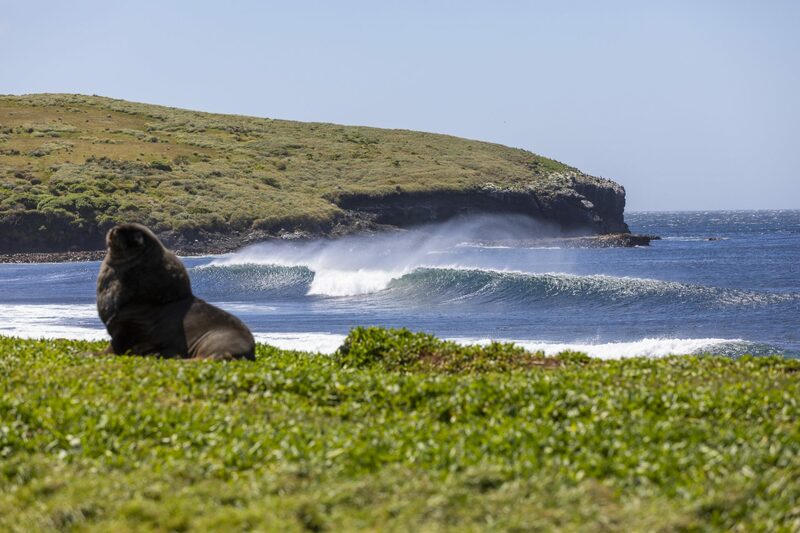 That makes him something of an expert about the biggest marine mammal patrolling the surf breaks. Our plan for the day is to walk across a boardwalk that intersects the island from the sea lion colony at Sandy Bay, through rata forest and fields of flowering megaherbs to the exposed cliffs of the north west coast and to then loop clockwise around the island’s coast back to Sandy Bay. I’m told that will give me the best chance to see the waves that exist along the east coast of the island. I quiz Martin about them and he returns a puzzled glance. I quickly hustle back onto the subject of sea lions and his face flushes with excitement. Initially Martin’s work on Enderby Island focused on numbers. Stints on Enderby fell upon Martin during work as part of a fisheries research division team working on the Campbell Plateau with the German fisheries research people studying the fisheries resources of the Campbell Plateau. Martin went back to head office, drew up a proposal and gave it to his boss. Martin sought a lot of advice from a number of international experts including some of the world’s pre-eminent bio statisticians. 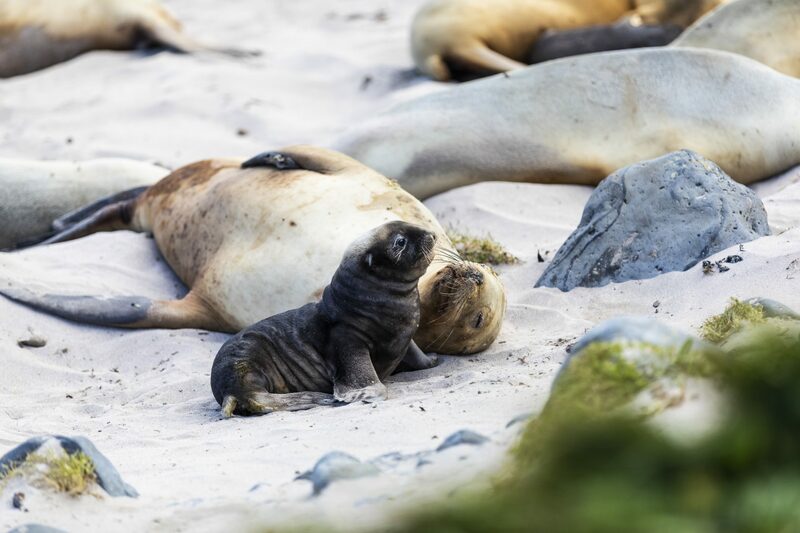 So each summer, Martin would leave his young family and travel south to tag as many sea lion pups as possible. The rest of his year was spent analysing the data, and working on the fisheries research for the Ministry of Agriculture and Fisheries. When my daughter came down with Heritage Expeditions on a trip she told me that now she understood why I spent the first 14 summers of her life away from home. That was nice, because I felt bad about it, but at least she understood and appreciated why we were doing what we were doing. We walk across a field of flowering megaherbs that look like something from another planet. Albatross nest here and there among the plants and we’re careful not to spook a sea lion from its slumber. I ask Martin if he ever had any hairy moments with the sea lions during his field work. He laughs and shakes his head. I think for a moment and then ask him how he might go about tagging a fully grown sea lion? He said he was compelled to come back in the winter because he wanted to see how much the pups grew in six months. Martin and his team also attached time-depth recorders that were cutting edge at the time. Martin said they weren’t worried about the males. We reach the end of the boardwalk and the northern coastline, which is beaten by the sea into a series of cliffs with overhanging cirques and indents pummelled into it. A short period 2m southwest swell runs beneath the chop, disturbed by a light north-westerly airflow. 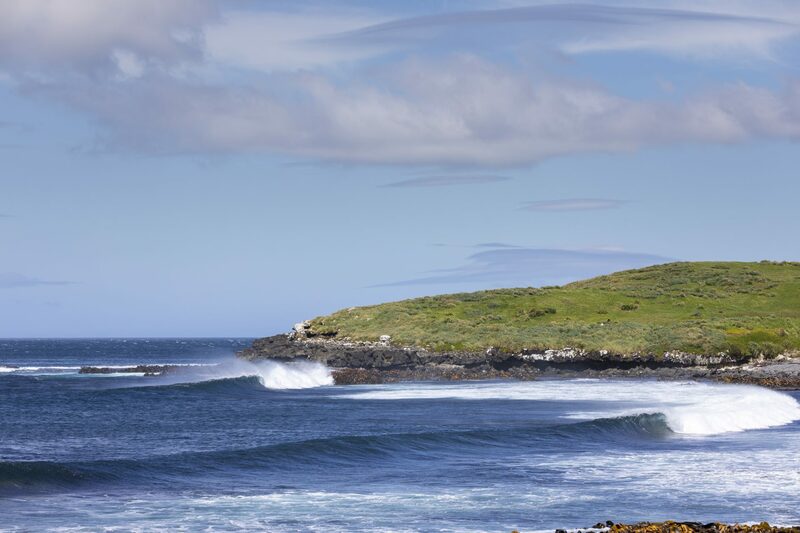 This coast topography holds little hope for waves. We head east along the clifftops. Martin points out four light-mantled sooty albatross nesting in an overhang along the cliff edge below us. The net Martin designed and patented features an escape hatch near the top of the net to allow mammals to escape. 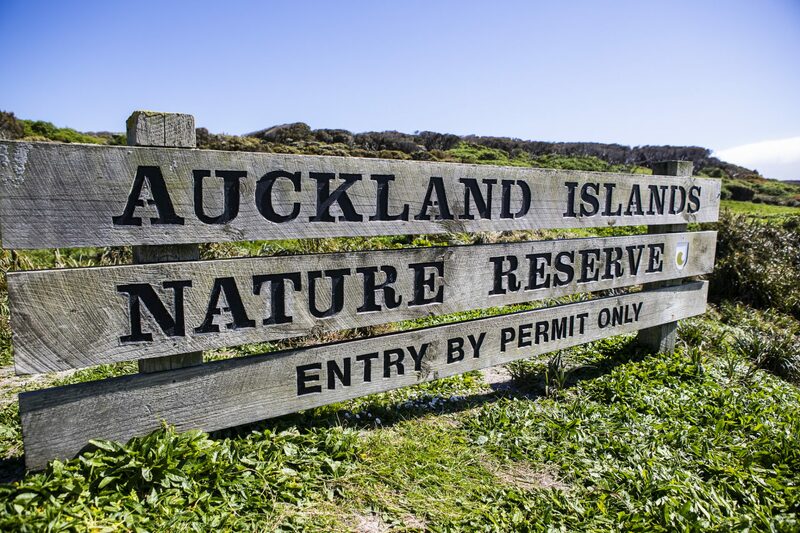 It has been a year since Martin has been on Enderby Island, which had its rabbits and cattle removed, along with all other introduced pests by 2001. Since that point it’s bowling green contours have been reclaimed by native herbs and scrub. It’s quite different from what Martin first encountered. Martin said it had been through that sampling through the vets at Massey that they had been able to pin down a major cause of mortality, which is Klebsiella – a bacteria. 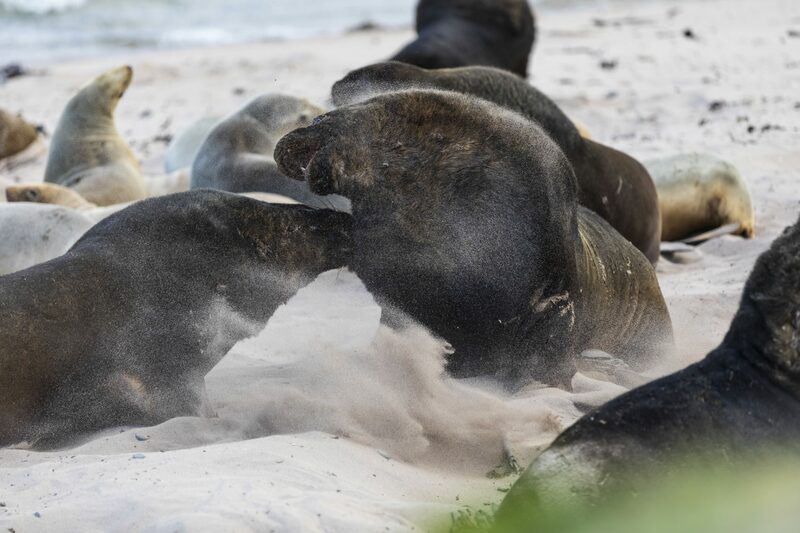 Other sources of mortality for pups – include getting squashed on the beach during fighting among the 400kg-plus males and they are occasionally abandoned by their mothers who can’t find them or are too immature and wander off and lose interest. When the pups are big enough to enter the water they can get taken by sharks. Starvation is another major cause of pup death, usually from mothers losing their pups or the pups being abducted by other animals. Despite the many risks Martin said he felt good about the prognosis for sea lions in the long term. He said one unknown was what the level of emigration and immigration was between rookeries, but that certainly happened when he was at Enderby. The pups that went to Campbell Island returned to Enderby to breed. Martin said the Otago colonies were too small to count, but were a promising sign. Colleagues of mine were diving and suddenly found an animal had taken hold of their head just like that. When you think of an animal that can fit your head inside its mouth with room for those big canine teeth, it’s a bit scary. 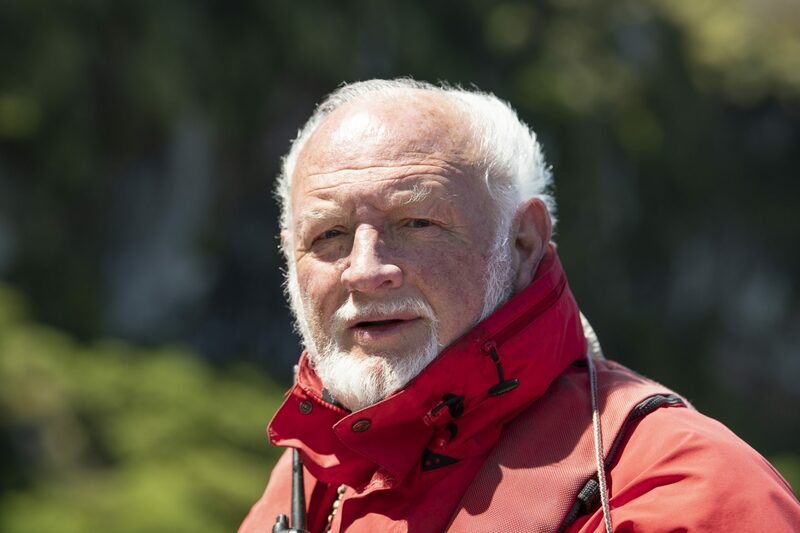 I ask Martin if he had learnt any tricks to deal with sea lions during his years on Enderby. We round a corner past the deep water Whakahao Bay and Derry Castle Reef comes into view. It wasn’t a welcome sight on March 28, 1887 when the iron barque Derry Castle sailed into it and killed all onboard apart from just eight survivors. But for me the familiar shape of a bowling left running on the eastern side of the reef fills me with promise. I watch as three waves reel down and then the ocean goes flat. A couple of sea lions swim around the kelpy peak. “Colleagues of mine, who were down here at the same time as me doing an inshore fisheries survey, were diving and suddenly found an animal had taken hold of their head just like that,” he shows me clamping his fingers on to his scalp like the jaws of a sea lion. We make our way toward the lefthander as more sets twist around Derry Castle Reef and roll back upon themselves. I ask Martin about the future for the sea lion population. The left peeling into Bones Bay has a distinct peak defined by kelp. The norwester blows straight across it, rippling the take-off. The second section is also defined by kelpy fronds before the wave peels into the bay. There are three waves in every set and it’s about as good as I have seen a wave so far. I’d imagine on a bigger swell it would break further outside but still hold its shape into the bay. It’s about three to four foot on the bigger sets. You wouldn’t want it any smaller. About 1km further east and a finger of submerged reef breaks in a criss-cross of chaos. I’ve seen the reefs at Timaru in a similar state and it has similar aesthetics to Crosswaves at Newport in Sydney. On a big swell there it would be an interesting place to check. The coastline then bluffs out with little promise for surf right across to Gargoyle Point. Martin tells me that his last season here was the 1993-1994 season. The faulty gas bottle exploded, luckily while everyone was out, and quickly reduced the hut, belongings and research equipment to ashes. Martin went solo after that, left government and took contract work thereafter. I ask him if he misses his time on Enderby and his sea lions. Martin recorded 13 pups during our visit, including several that were born in front of us. 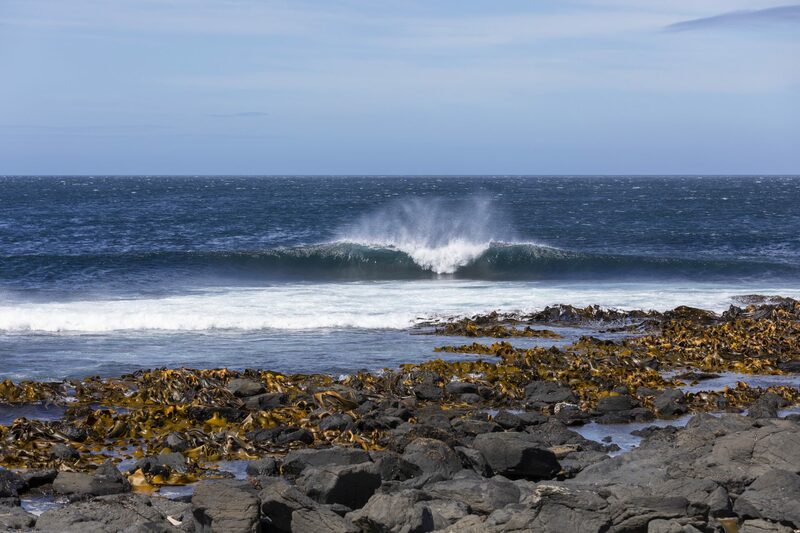 We scramble through head high tussock and scrub toward Gargoyle Point and are rewarded with a bay filled with waves and the norwester feathering them at just the right angle. East Bay is the eastern most bay of Enderby Island and has a lefthand point in the north end, a peak in the middle and a righthand point in its south end. 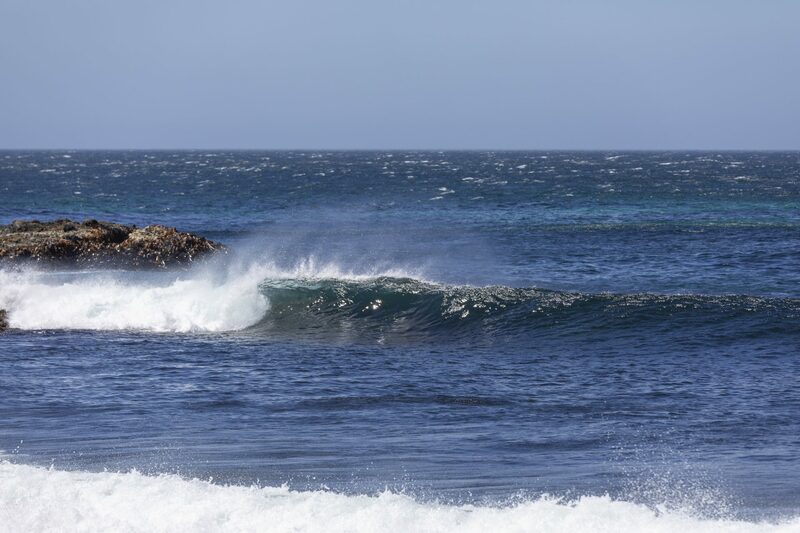 At around 3 foot the lefthander breaks on a shallow rock slab and then winds out into the bouldery bay, but on a bigger swell it links up a lot better – only the biggest sets would make it right through. The peak has a short right, but is more of a left that peels nicely into an eventual closeout where it meets up with the righthand point. It reminds me of Tapotupotu Bay near Cape Reinga in that it relies on swell wrapping around and into the bay, albeit with a decent point at each end. The left is quite hollow at times. 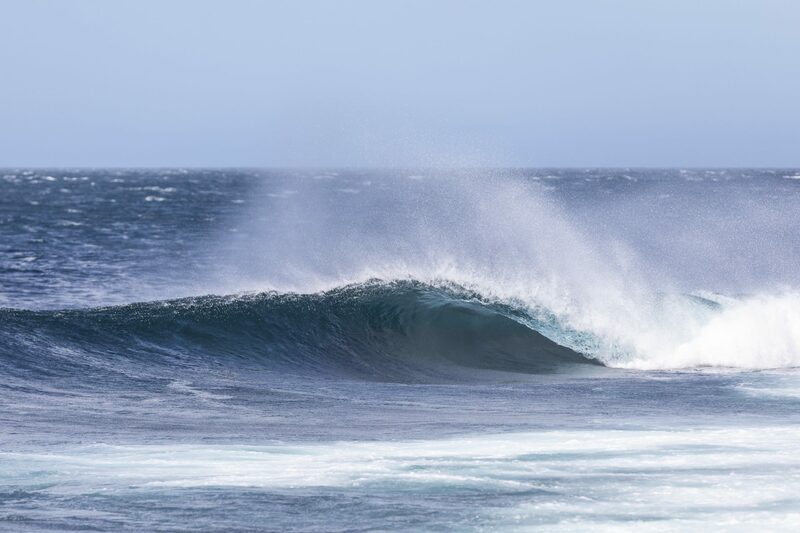 The righthand point is definitely the star of this trilogy, with consistent lengthy rides of 100m or more and the potential on bigger days to link from an outer rockslab right through. There are some shallow sections, but overall the pace of this wave looks like a mirror image of the Valley at Raglan. East Bay is also popular among sea lions and we watch one surf right in towards us. Meanwhile a large male, with three females in tow, fends off rivals on the grassy embankment next to us. We reluctantly leave East Bay and head towards Sandy Bay – still a few hours trek away. I feel strangely satisfied to have found some waves but tinged with that familiar pang of anxiety at the possibility of being able to surf them one day. Logistically, that was not going to happen on this trip. The next feature on the coastline is Pebble Point, the last exposed coastline on Enderby before Port Ross. 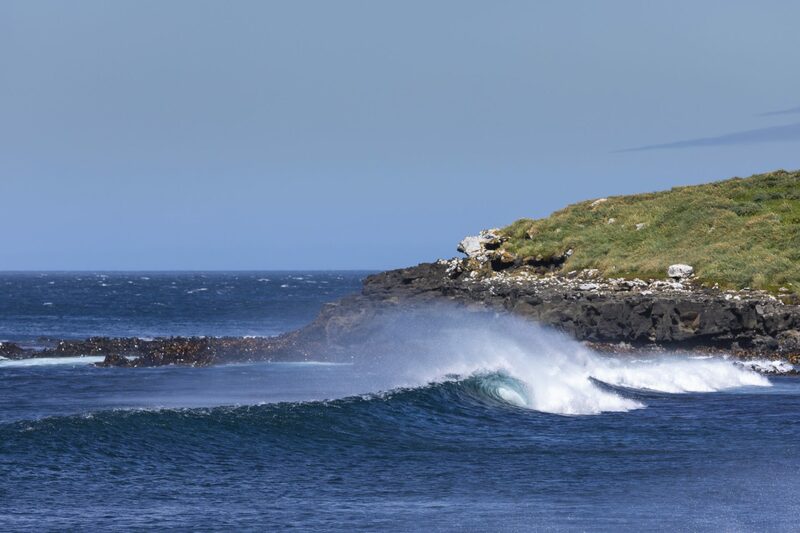 I know waves have been spotted here from some of my surfing scientist friends who have spent time down here during winter studying the southern right whales. True to reports, a righthander peels along a finger of reef. In this swell it’s on the small side, but definitely rideable on the bigger sets and promises a couple of fast, hollow sections. 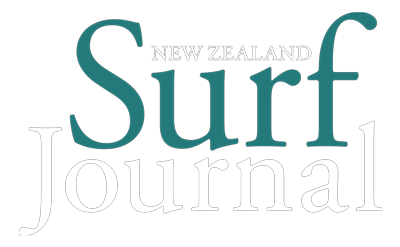 A small rock slab bowls up glassy on the northern side of the bay – too small to surf, but with shades of The Spit at Mahia. I wonder if it might produce a more meaningful wave with a big swell running. Again the line-up is dominated by sea life with sea lions making the most of the sunny afternoon. One particular animal darts in and out riding waves repetitively from the peak through to the kelp. There’s no question they’d love to have a human to entertain them out there. That won’t be me today as I still have a few kilometres of coastline to walk back to Sandy Bay. Surfing on Enderby Island is a bit of a logistical challenge. It requires a permit from Doc and you’d need a decent vessel to get here across the wild gauntlet of Southern Ocean. Then you’d need to be prepared to share waves with very large sea lions. In the back of your mind will be sharks and so they should be. They’re commonplace here, large and not well socialised with humans. I’d suggest going as far as wearing a shark suit or repellent device similar to the ones used by divers in South Australia. The water itself is around 12°C and I was warm in my 4:3 steamer with hood vest, booties and gloves. 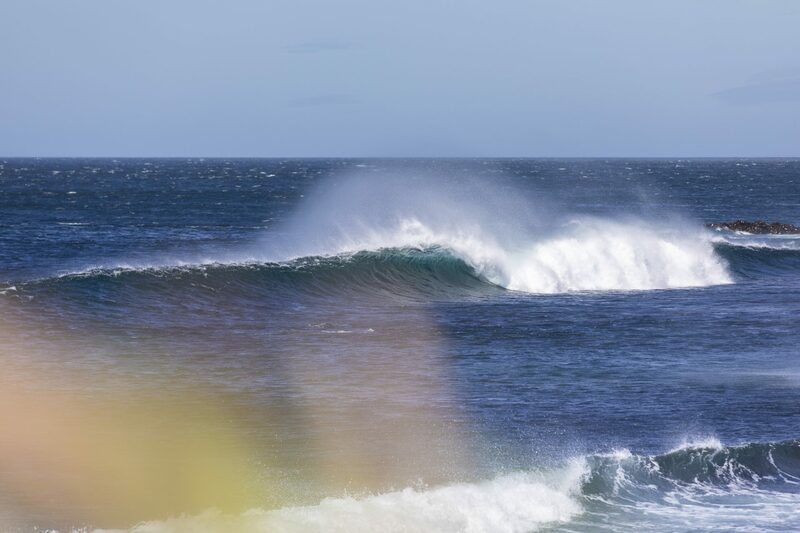 We’re keen to revisit these waves. 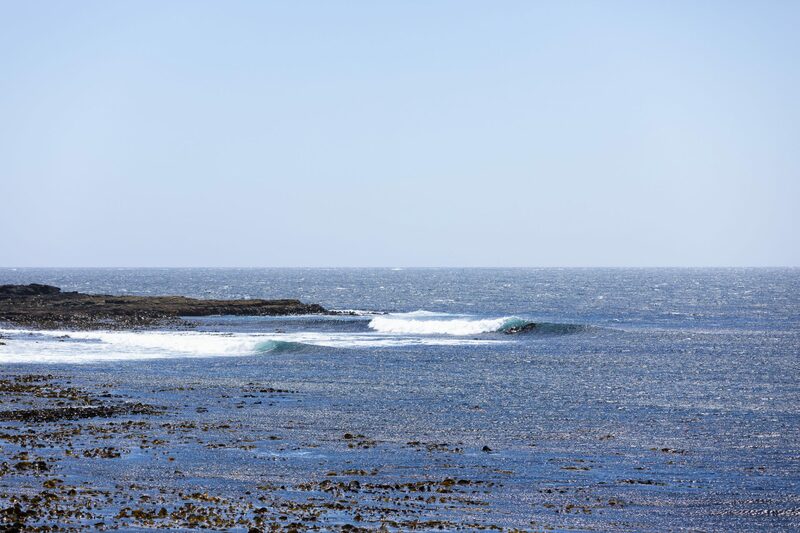 If you are interested then get in touch as we’d love to put a crew together to go and surf these and explore a little further. Bring your brave.